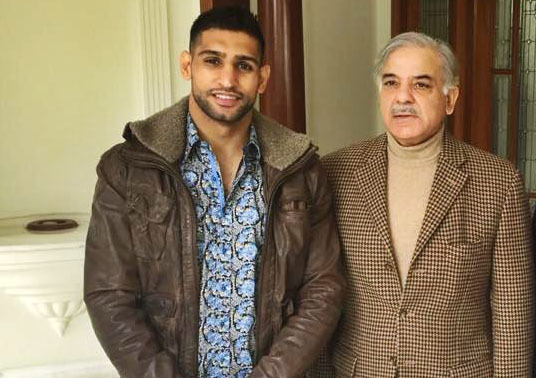 LAHORE (92 News) – Chief Minister Punjab Shahbaz Sharif has on Monday met with the British boxer Amir Khan and exchanged view over promotion of Boxing in the country. The chief minister said that Amir Khan has promoted country’s name in the boxing field. He said that we will benefit from the expertise of Amir Khan to promote boxing in the country. Sharif said that Pakistan has a lot of talent in every field and the only thing we need is to promote this talent. British boxer Amir Khan said that he wanted to train Pakistani boxers according to international standards, adding that the chief minister Punjab is taking positive steps to promote sports in the province. Provincial minister for education Rana Mashood Ahmad, provincial sports secretary, British boxer Amir Khan’s father Sajjad Khan and his brother Tahir Khan were also present on the occasion.